The N7 highway to the north is an interesting drive. As you leave the hustle and bustle of the city you enter a completely different world when you reach the country towns of Malmesbury, Moorreesburg and Piketberg. The scenery in these areas is remarkable, in the winter months you will have fields of green and yellow as the wheat and granola crops grow. 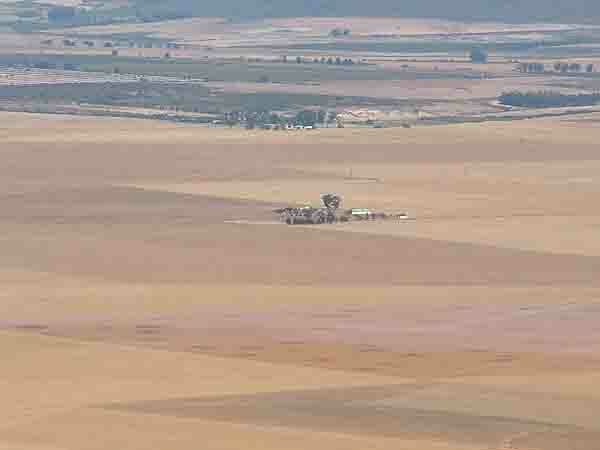 In midsummer as it is now the green fields have turned into gold as the crops have been harvested and the wheat stalks left in the fields have dried out. Looking back from the Piekernierskloof pass the golden valley stretches for miles in all directions with the only break in the golden colour being the N7 highway and a river or two flowing across the valley. Following the N7 northwards over the pass one soon arrives in another world. The change is remarkable as you leave the golden valley behind and enter a river valley filled with thousands of citrus trees. On either side of the valley are mountains towering over the river and their slopes are covered with short bush . 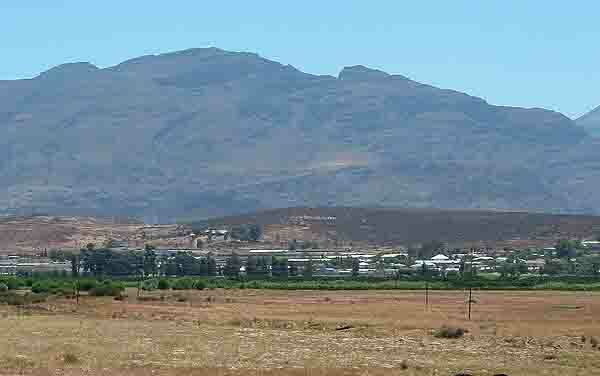 Citrusdal is the first town one comes across as you drive down the Piekernierskloof pass. 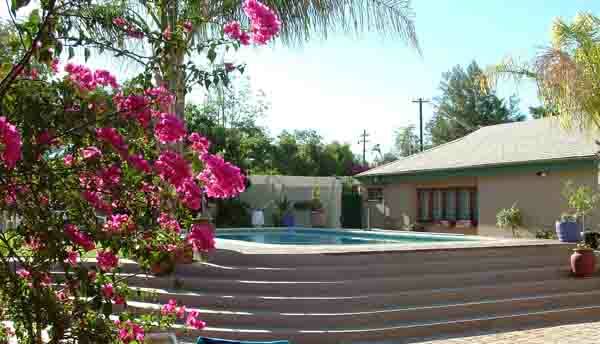 It is situated on the banks of the Olifants river and is surrounded by mountains and citrus trees. The Olifants River valley was first discovered way back in 1660 when explorers crossed the Piekerniers mountain range and found the valley full of elephants hence its name Elephants River. Citrusdal is well known for its mineral baths which were established way back in 1739 when self catering chalets were built near the baths. Many of the old buildings have been restored and can be utilised today when you visit the baths. Leaving Citrusdal we follow the banks of the Olifants river northwards. 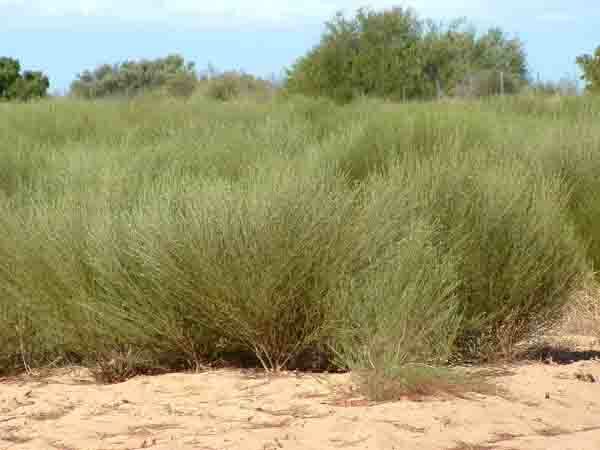 Its banks are like an oasis in a desert as all along its course are either orchards or groves of trees growing while just a short distance away we have semi desert conditions. 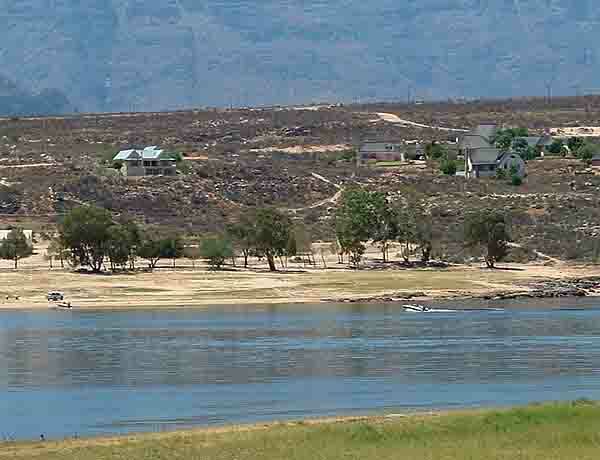 Clanwilliam is the next town along the N7 but before you reach the town you come across the Clanwilliam dam. At the time of our visit in early February the dam was 46% full and looked a picture as it lay glistening between the mountains that surround the town. On our return trip a day later the dam was only 45% full and given the heat and the speed which the water in the dam was being utilised the dam should have been empty within six weeks. Clanwilliam is a historic town where people started settling in 1725. The main street of the town is filled with old buildings and old churches. 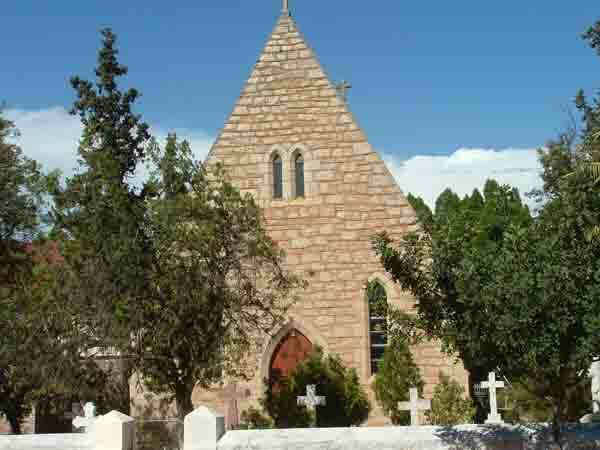 One of the old churches is the St John the Evangelist Anglican parish that was established in 1857 and consecrated by Bishop Robert Gray Anglican Bishop of St George's Cathedral in Cape Town in October 1866. As is usual in country towns in South Africa most of them grew up around a Dutch Reformed Church. 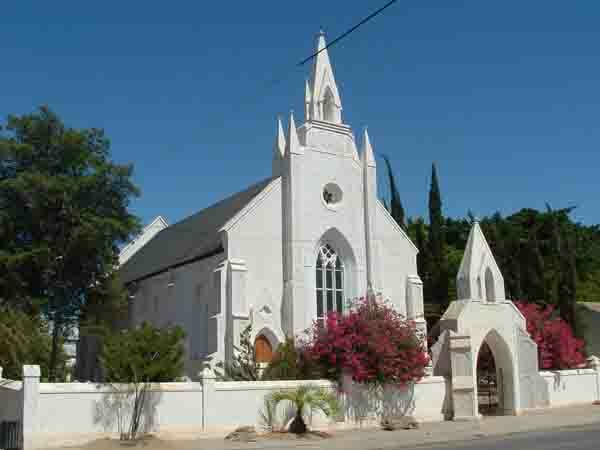 Clanwilliam is no exception and in its main road you can find the "Flower Church" which was built in 1864 and is still used as a church today. Its claim to fame however is that it is used for the annual flower show held in the town each year . Main Street as it is known today is in fact not the original main road of Clanwilliam. The original main road leads off to the left from Main street where the road splits near the old prison. In this street their are a number of old Cape Dutch houses all beautifully restored. Today the town is at the centre of the Rooibos tea industry and is surrounded by fields of this tea bush. Its needle like leaves produce a tasty and aromatic tea that enhances ones health and is especially beneficial to the nervous system. Benjamin Ginsberg a Russian immigrant first marketed the tea in 1904. 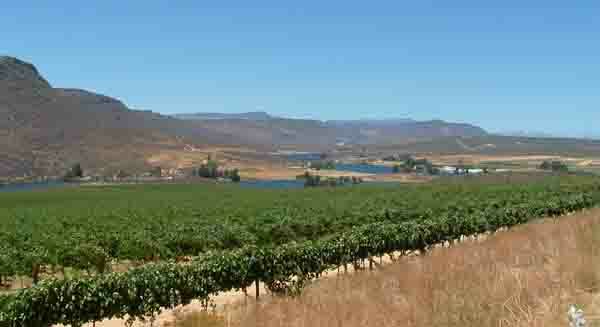 Other attractions are the Clanwilliam dam which is well known for its water skiing and also for its bass fishing. On its banks it has a number of bungalows that can be hired for holidays and weekends and it also has a large camp site with some sites electrified. For visitors from abroad who want to get away from the northern winter Clanwilliam is the place to visit. In the summer months its temperatures reach the high 40's centigrade and even mad dogs and englishmen look for shelter in the shade. Many of the locals have gone into tourist activities and have turned their homes into bed and breakfast establishments catering for people wanting to escape the northern winters. They provide shelter from the heat of the day by providing airconditioned rooms and swimming pools for their guests. One such establishment is Clan Court owned and run by John and Sheena Nutter. Their heated salt water pool is to die for especially at 10.00 pm at night when it is still 35 degrees centigrade outside. Clanwilliam being about 250 kilometres from the Cape Town is far away from the city pollution and lights and so by lying back in the pool at Clan Court having a late night dip one gets a spectacular view of the stars in the night sky. If it were not for the Oliphants river the lush valley would be a desolate semi desert area. The locals farmers have utilised the river well and produce some of the best oranges in the world in this valley. About 24 kilometres downstream from the Clanwilliam dam is another dam named the "Bulshoek Dam" which is also utilised for irrigation. On its banks a number of vineyards have been planted which beautify the surrounding area. South Africans love water so the dam owners have established a campsite with self catering bungalows and facilities for caravans and tents close to the dam. Counting the number of boats on the dam the campsite appears to be popular with locals. The Clanwilliam area may be a long drive from Cape Town but once you arrive and settle into your B&B its a great place to visit. Give yourself time to explore the village and its surrounding areas and if you have a 4X4 vehicle you can also explore some of the outlying areas using the old mountain passes built by the farmers of yesteryear.